St. John is one of Ottawa’s oldest Lutheran Churches. Founded in 1895, we have welcomed all members of the Ottawa and surrounding communities for over 120 years. We worship every Sunday morning at 10am. 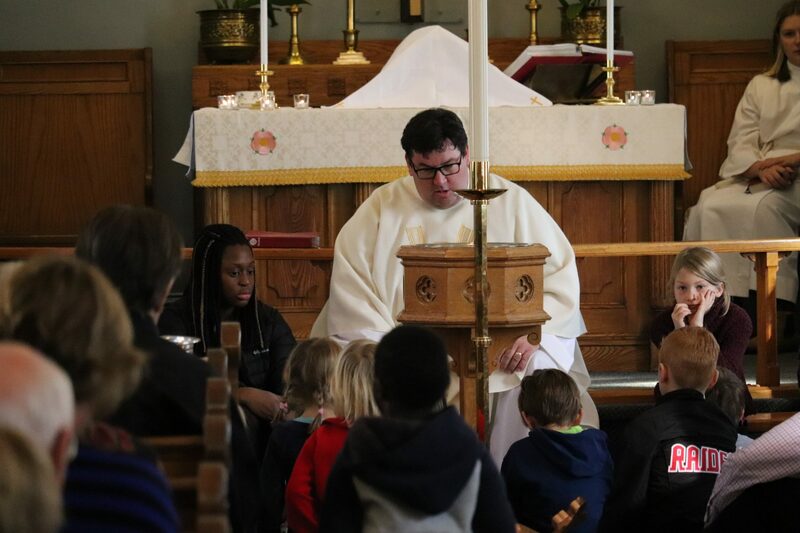 When St. John first became a German Lutheran congregation, serving mostly newcomers to Canada, the church sat in the middle of farmer’s fields. Now it’s surrounded by family homes and condos, in a thriving community close to Ottawa’s downtown. The face of the church has changed with it: its members now speak more than a dozen languages and have roots around the world. The church continues to open its door to its neighbors: welcoming a community playgroup and lively Christmas party, providing a home to the MacDonald Cartier Academy, and this year, offering space for a new local youth choir with a focus on global music. The church also serves its community – providing year-round support to the Partage Vanier food bank, visitation, and a Christmas morning service at the Garry J. Armstrong Center for seniors, as well as ecumenical and inter-faith activities. St John has also looked beyond Canada for places to help. In the last eight years, the church has sponsored four refugees from Liberia, a large and costly commitment for a congregation of about 140 people. And it has raised the money to build a well providing public access in a neighborhood in Liberia where water is chronically short. This kind of global focus teaches our youth an important lesson about being citizens of the world. They’ve learned that their work here, whether it’s handling the cash at the garage sale, making Christmas cards, or selling herbs on Mother’s Day, can make big differences in the lives of others. For the last few years, the youth at church have been using the proceeds from selling donated items at New Edinburgh’s garage sale to buy school kits – the supplies are then purchased and assembled into kits on Sunday morning. This year was no different, with the young people kicking off their fundraising efforts at the garage sale. The project is expected to take the entire year and many Sunday mornings – to say nothing of thousands of pencils and notebooks. Their work requires the success of wider partnerships, including an agreement between CLWR and Home Hardware, which covers the cost of shipping the supplies to a central location in Canada, and an arrangement with the Canadian government to help with overseas shipping. A pastor’s kid from Lunenburg, N.S., Joel Crouse received his ordination in 1997 after graduating with his master’s degree in theology from Waterloo Lutheran Seminary. He was called to Zion Lutheran Church in Pembroke, where he served for four years before accepting a call to St. John Lutheran Church in Ottawa. In addition to his social justice focus, he has served on the award-winning Interfaith Ottawa, Christian Council for the Capital Area as well as several joint Anglican-Lutheran initiatives. Joel is married to Erin Anderssen and has two sons, Noah and Samson. His role models are his parents, Rev. Keith and Grethe Crouse, now retired after 45 years of ministry, who continue to teach him about compassion and faith. The Evangelical Lutheran Church in Canada is Canada’s largest Lutheran denomination with over 152,500 baptized members in 607 congregations. It welcomes people from all walks of life into the loving embrace of community and faith. The mission of the ELCIC, as an expression of the universal Church and as an instrument of the Holy Spirit, is to bring the Gospel of Jesus Christ to people in Canada and around the world through the proclamation of the Word, the administration of the Sacraments and through service in Christ’s name.